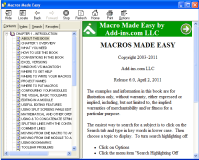 Macros Made Easy is a downloadable book for Microsoft Excel that teaches you how to write macros. It is compatible with Microsoft Excel 2007 to 2019 and Office 365. When you purchase, you get the book in both Windows help file format and in PDF format. Help file format gives you great search capability. PDF format is great for printing. Both are easy to read. It is full of many practical macro examples and VBA solutions that are useful for both the experienced user and the beginner. You can copy the numerous examples directly from the help files and use them in your work. The search feature in the help files allows you to very easily search on any word (each file has a full index of key words) and then jump to any of the related topics or examples that are found. For more information on the chapters view the topics by chapter detail. 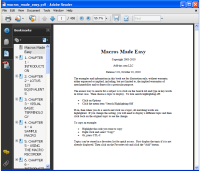 If you purchase the Macro Book Collection for Microsoft Excel or the Macros Made Easy book and we update the books with new examples (typically done several times a year), then you can download the updates for up to a year from your purchase date. Alio Kane wrote: I just want to thank you for putting a great book out there for people to use to develop them self or pursue their dream, as such as my self. Your book is detail, simple and well design from a step by step process stand point; I can tell that you enjoy helping people. I just read the “Introduction” chapter and I’m very impressed with you teaching skills / method.